Question: What have a Blue Dolphin, a Pickle Tracker and a Bavarian Knight got in common? 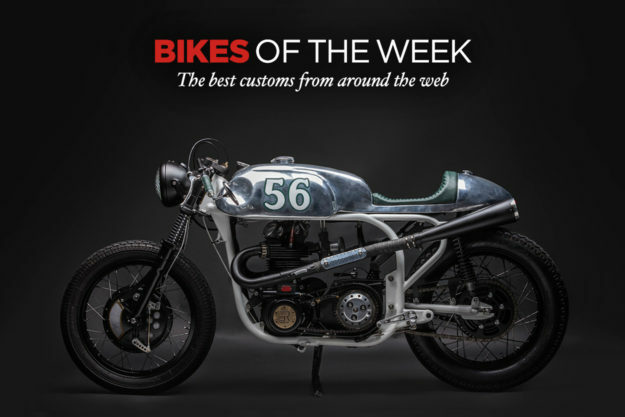 Answer: They’re all beautiful customs with truly daft names—but they’ve made it into our latest Bikes Of The Week. 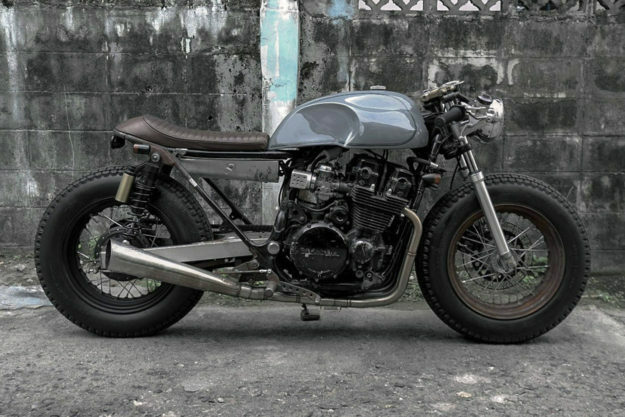 Honda CBX750F by Half Caste Creations Ten years ago, the lads from Bangkok’s Half Caste Creations were asked if they’d part with their first build. Since they were just starting out at the time, they decided to decline the offer—the bike was a showpiece to help grow their name. Norton Dominator by Elemental Rides Built as a tribute to the first twin-cylinder Norton Domiracers to run the ton at the Isle of Man TT, this 1961 Dominator 88 comes to us from Ricardo Santos of Elemental Rides in Porto, Portugal. It’s more than a styling exercise though: Ricardo built ‘Baryta’ to be his ultimate street-able Domiracer. 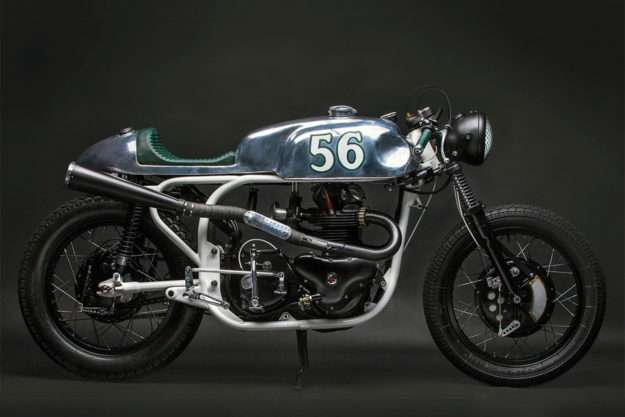 This 155 kg (340 pound) Norton has received numerous upgrades, with a period-correct bent. The vintage featherbed frame has been deburred, and the tank, seat and oil reservoir are a one-piece hand built unit. The raw metal finish on top of the creamy white Reynolds tubing is spot on. The wheels are Borranis, with front drums coming from a modified 9-inch Robinson replica kit and a one-off 8-inch hybrid unit in the rear. The engine has been rebuilt and ported with high-compression pistons squeezed in—but the tuning has been fiddled with, and the bike fires on the first kick. Yamaha Virago 250 by Matt Fuller His roots are deeply entrenched in supermoto and flat track racing, so it’s no surprise that ‘light and nimble’ are the key components of a Matt Fuller build. This time out, the Florida native has delivered a stripped-down Yamaha Virago 250 bobber. 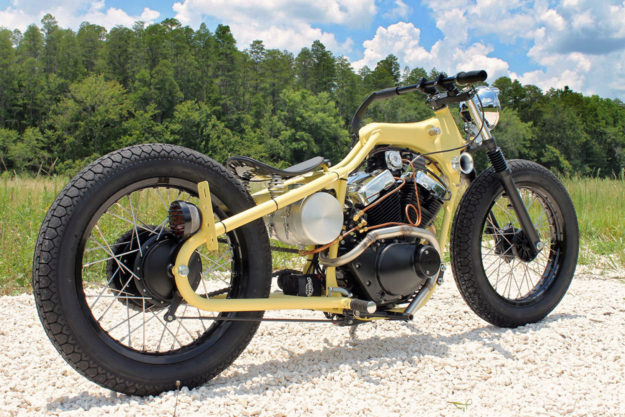 Converted to a hardtail design, the Beach Bobber is a lightweight, fender-less sandflea. The fuel cell has been relocated to under the seat, which not only centralizes mass but also emphasizes the raw aesthetic and exposed spine. The tiny 250 twin runs a wide-open custom exhaust that I figure must reverb like crazy on asphalt, thanks to the downshooter exits and the bike’s low stance. Harley-Davidson Sportster by RSD It sports a sticker that reads “Keep hipsters off Harleys.” But Roland Sands’ Pickle Tracker ticks all the right boxes for the neck-beard crowd—and many others. Born from the wreckage of multiple Hooligan highsides, the Pickle Tracker was previously RSD’s famous Ameri-Tracker. 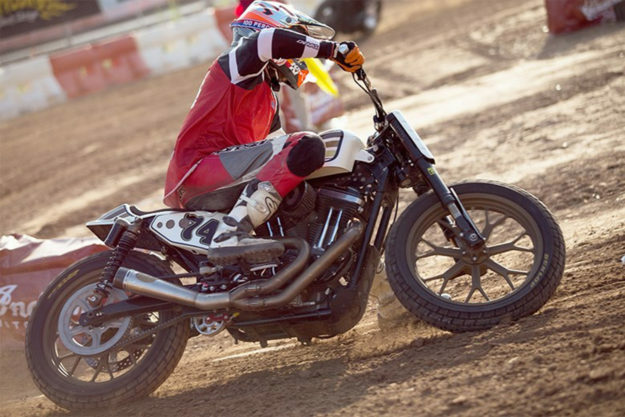 After a complete rebuild, this Hooligan Sportster is now a leaner and meaner machine. Upgraded suspension and lightweight Del Mar Wheels keep this Sporty planted and sideways around the dirt oval; an RSD Slant 2-into-1 exhaust system and Carbon Fiber intake help the thunderjugs breathe. 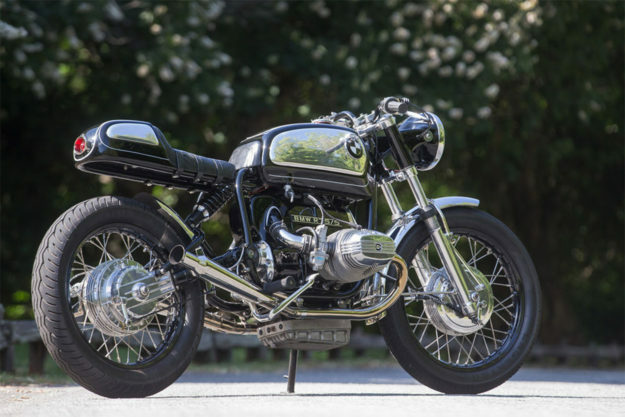 BMW R75/5 by Fuller Moto If you’ve visited this section of cyberspace before, Bryan Fuller is undoubtedly familiar. He’s been raising our eyebrows with his custom creations for some time now. It’s clear the man has talent. With his latest build—a BMW R75/5—Fuller focused his attention on subtlety and better-than-factory finishing. The Bavarian Knight is a lighter, tighter interpretation of what a 70s Beemer should be. The slender tail is a work of art, and the polish on that airhead is simply divine. If that’s not enough to drop your jaw, check out the simple yet sublime exhaust hanger brackets keeping those cocktail shakers perfectly positioned.